Albania was occupied to a large extent during World War I by Austro-Hungarian forces. The aged Emperor Franz Joseph I (1830-1916) who had ruled over the Austro-Hungarian Empire from 1848 to 1916, died on 21 November 1916, and was succeeded by his grandnephew, the Emperor Karl (1887-1922), who reigned until the collapse of the monarchy and the empire in November 1918. 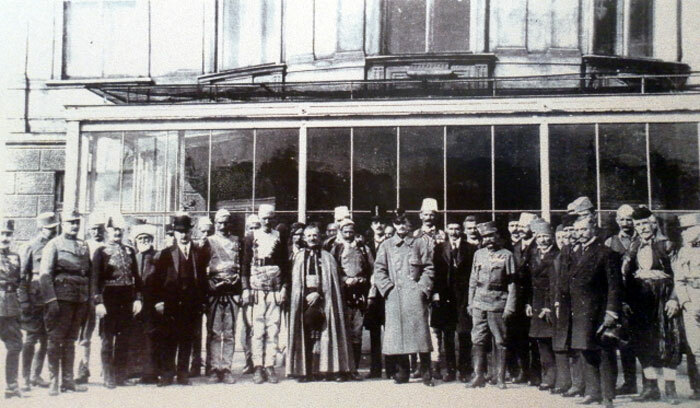 In April 1917, the highest in command of Austro-Hungarian forces in Albania, General Ignaz Freiherr Trollmann von Lovcenberg (1860-1919), invited a large delegation of Albanian leaders to Vienna, ostensibly to pay homage to the new emperor, but also no doubt in order to garner Albanian support for Austria-Hungary at a time when the monarchy’s forces were flagging. Most of the tribal chiefs had never been outside of Albania and it is easy to imagine their bewilderment when hobnobbing with the crème de la crème of Viennese society. The report of their visit, distributed to the press by the “Albanian Correspondence” of Leo Freundlich, also records the bewilderment of the Viennese population at the sight of the exotic figures from Albania. A 34-man Albanian deputation arrived in Vienna last night, headed by the Highest in Command in Albania, Ignaz Trollmann, in order to pay homage to the Emperor Karl on behalf of Albania. All regions of the occupied zone and all the religious communities are represented in the deputation. Skutari [Shkodra] is represented by Mussah Efendi Juka, Kol Ujka and Hasan Efendi Bekteshi. The Catholic highlands sent the well-known bajraktar of Shkreli, Vat Marashi, the voyvode of Kastrati, Gjelosh Gjoka, and the Muslim nobleman Abdi Kola Bey of Shala. Postripa sent the voyvode Hasan Ahmeti. Alessio [Lezha] is represented by the well-known chieftains of Klementi [Kelmendi], Ded Coku, and of Bregumatja, Mano Bey and Mehmed Bey. Puka and Mirdita are represented by kapetan Ndue Gjoni, the voyvode Zef Noci, and the voyvode Zejnel Aga. Mati is represented by the most illustrious of the families, Zogoli, Ahmed Bey; Kruja by the Naib-Mufti, Muharrem Pengili; Tirana by Djellal Bey Toptani (a cousin of Essad) and Musa Naci; Durazzo [Durrës] by the mayor Izzedin Beshiri and the parish priest of the town, the protonotary apostolical Monsignore Nicholas Kaciorri. The district of Kavaja is represented by the mayor, Kasim Bey, and by Shehziver Bey; Elbasan by the former Albanian Postal Minister, Lef Nosi, and Irfan Bey. The districts of Berat and Skrapari sent Sami Bey Vrioni, who is the former seneschal of Prinz Wied and son-in-law of Essad Toptani, the Mufti Mehmed Essad, and Demeter Lavda; the district of Lushnja sent Ahmed Bey Ressuli and Emin Vockopola. The district of Fieri is represented by Kahreman Vrioni. The region of Xhyra-Peshkopia is represented by the tribal chieftain Elez Jusuf and the sub-prefect of Luma, Salih Spahia, Krasniqi by the well-known chieftain and sub-prefect Hysni Bey Curri, and Zadrima by A. Miloti. Also in the delegation was the former Albanian minister Hasan Bey Prishtina who represented the Albanians of Kosovo. General Trollmann was accompanied by General Staff officer First Lieutenant Myrdacz, Captain Wimmer, and by his personal adjutants First Lieutenant Holzpach and First Lieutenant Vukic. The deputation was greeted at the train station by General Staff Captain Ritter von Gross, Captain Stojakowic and Consul von Rudnay. Once General Trollmann presented the officers, Consul von Rudnay and Editor in Chief Freundlich, the members of the deputation departed for the hotels in a long convoy of automobiles. This morning, the Albanian deputation paying homage to the Emperor visited the Imperial Treasury with General Trollmann. At 10:00, the members of the deputation arrived at the Treasury in their military vehicles and were joined by General Trollmann in the vestibule. In the Treasury, the deputation was greeted by the Imperial Treasurer Count Berchtold who welcomed them in an address. In addition to Count Berchtold, the head of the Treasury, Baron Weckbecker, was also present. The members of the deputation visited the collection of the Treasury with lively interest, and expressed their admiration and amazement. Professors Pekmezi and Rrota interpreted the explanations given. After the visit to the Treasury, the members of the deputation visited the Kunsthistorisches Museum [art museum], accompanied once again by Imperial Treasurer Count Berchtold. The administrative head of the museum, Baron Hold, and several custodians led them through the museum. The museum’s large collection of weapons and the other collections were the object of great interest and admiration from the members of the deputation. 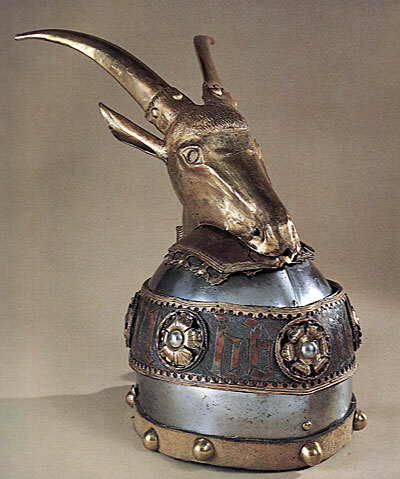 Of course, attention was focussed in particular on the two objects exhibited in the museum that are sacred to the Albanian nation - the sword and helmet of Scanderbeg. After the visit to the Kunsthistorisches Museum, the members of the deputation returned by automobile to their hotels. Passers-by were particularly impressed by the exotic figures in their splendid national costumes. At 12:30, a luncheon was held for them at the Hotel Meissl & Schadn, at the invitation of Infantry General Ignaz Trollmann. At 15:00 the Albanian guests went on a tour of the town, using a salon car of the city tramways on the Ring and to the Central Cemetery, where they visited the graves of various heroes and of Mayor Lueger. On behalf of the deputation, First Lieutenant Myrdacz, acting for General Trollmann, laid a wreath of laurels with a bow in Albanian colours at the army monument. The deputation then returned to town. At 19:30 a dinner was given at the Erzherzog Karl Hotel. Wherever the members of the Albanian deputation were glimpsed by the public, they were the subject of great curiosity and amazement. Particularly noticed were the various chiefs of the northern Albanian tribes. These are particularly tall individuals of martial appearance, and this latter characteristic was conveyed all the more by their colourful costumes. Most of the chiefs of the mountain tribes wear gold-embroidered jackets on white felt clothing and with white Albanian caps. In their belts, they carry heavy old weapons plated in silver. Some of the Muslim priests in the deputation were also the subject of wonder with their long flowing garments and white turbans. Wherever the Albanian guests turned up, they were welcomed and adulated by the public. The members of the Albanian deputation expressed their profound satisfaction that their wish was being fulfilled to pay homage to the Emperor personally. They are impressed by everything they have seen in Vienna and have been lavish in their praise of the beauties of the Austrian capital. As the “Albanian Correspondence” has learned, the Albanian deputation will be received by the Emperor on Wednesday, 18 April at 15:00. On the same day, they will be received at 16:15 by Foreign Minister Count Czernin and at 17:00 by the mayor, Dr. Weiskirchner. On Thursday, the 19th, Archduke Max will receive the deputation and Foreign Minister Count Czernin will hold a luncheon for them. On Thursday evening, the deputation will attend a performance at the Opera. This morning, the Albanian deputation, accompanied by General Trollmann, visited the Kapuzinergruft Imperial Crypt. General Trollmann held an emotional speech at the grave of Emperor Franz Joseph in which he paid tribute to the affection and benevolence that the late monarch had shown to Albania. The Albanian nation was filled with gratitude and love for the late Emperor Franz Joseph. On behalf of the deputation, General Trollmann laid a wreath at the monarch’s tomb. Hereinafter, Dr Pekmezi and Hasan Bey Prishtina spoke, the latter recalling how Albania had been saved by the glorious imperial army of the immortal emperor and stressing that the Albanians had gathered, like grateful children, to pay homage to the memory of Franz Joseph I. The deputation then drove to the Arsenal where they visited the hall of fame, the army museum and the captured artillery and cannons, in the accompaniment of Major General Hauser, Colonel Julius, First Lieutenant Kestler, Artillery Administrator Jaschek and Artillery Engineer Mell. After a visit to St Stephen’s Cathedral, the deputation dined at the invitation of General Trollmann at Hotel Bristol. This afternoon, the Albanian deputation was received by the Emperor and Empress in the Hofburg in a particularly ceremonious audience. The members of the deputation arrived at the Swiss Stairwell in ten military vehicles at three in the afternoon. The arrival of the members of the deputation, many of whom in their national costumes, was an extraordinarily colourful event. At 15:40, the deputation was received by the Emperor and the Empress. After an address by the head of the deputation, General Trollmann, the Emperor talked to quite a few of the Albanians. The audience, attended by Foreign Minister Count Czernin and Imperial Treasurer Count Berchtold, lasted 45 minutes. At the audience for the Albanian deputation, Xhelal Bey Toptani, a respected nobleman from Tirana, asked the Emperor for leave to present the Empress with a dress for the three-year-old Archduchess Adelheid, handmade in Albanian style. The dress, made of Albanian material with precious gold embroidering, was then handed over to the Empress by an Albanian first-year volunteer. All the members of the deputation were enthralled on their return from the Hofburg. After the audience with the Emperor and Empress, the Albanian deputation, led by Infantry General Trollmann, visited the Imperial and Royal Minister of Foreign Affairs. Count Czernin, who had just arrived from the audience in the Hofburg, welcomed the deputation with warm words and talked personally to many members of the deputation. The deputation then departed for a visit to the city hall. Mayor Dr. Weiskirchner, who received the visitors, welcomed General Trollmann as the famed conqueror of Lovcen and expressed his delight at being able to meet the appointed representatives of the Albanian people in the rooms of the Vienna City Hall. In his address, the mayor spoke of the brave Albanian national hero Scanderbeg and expressed the hope that an honourable peace would soon promote Albania’s cultural and economic advancement. General Trollmann thanked the Mayor for his gracious hospitality and explained that he was delighted to accompany a delegation of representatives from Albania to Vienna in order to pay homage to the Emperor. All of the members of the deputation regard their days in Vienna as a time of great satisfaction. Vienna, he said, had grown substantially before the war. He hoped that the imperial residence would progress once again after the war, under the leadership of the Mayor. The deputation then visited the festive rooms of the city hall. During dinner last night at the Erzherzog Karl Hotel, a number of Albanian students studying in Vienna were presented to the Highest in Command, Infantry General Trollmann. General Trollmann gave the young men words of encouragement and drew the attention of one student of the College of Agriculture to the importance for the future of Albania of rational and intensive farming. Today, led by the Highest in Command, Infantry General Ignaz Trollmann, the Albanian delegation visited the Spanish Riding School. The deputation was greeted here by the Emperor’s First Equerry, Count van der Straaten. A number of thoroughbred horses from the imperial stud farms performed the various paces of the school. The members of the deputation applauded enthusiastically at the performance. Accompanied by Count van der Straaten, the deputation then visited the Imperial Mews where they inspected the horses, the saddle room and the imperial coaches. They were then shown through the Museum of Natural History. 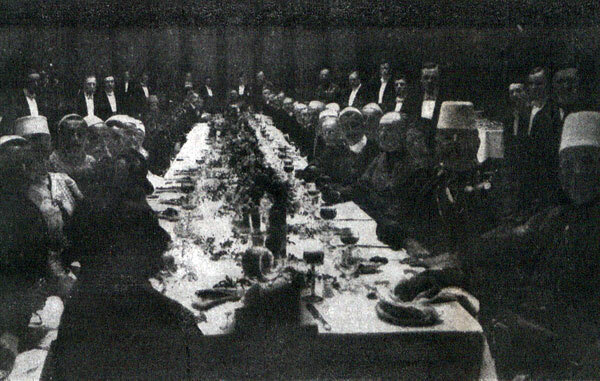 At 13:30, the Minister of Foreign Affairs, Count Czernin, invited the deputation to a luncheon at Hotel Imperial. During the meal, Baron von Flotow, Department Head, welcomed the guests on behalf of the Minister. Aside from Infantry General Trollmann and the members of the deputation, the following figures took part in the luncheon: Department Head Ippen, Consuls General Rappaport-Arbengau and Juristowski, Consul von Rudnay, Imperial Secretaries Baron Prandau, Baron Dipauli and von Eckardt, First Lieutenant Colonel Myrdacz, Captains Ritter von Cross and Stojakovic of the General Staff, Captain Wimmer, Personal Adjutant First Lieutenant Holzpach, etc. 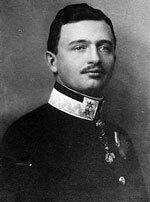 At 15:30, led by Infantry General Trollmann, the deputation was received at the Augarten Palace by Archduke Max in a special audience. At 16:00, the deputation continued on to a reception given by Imperial Treasurer Count Berchtold at his palace in the Strudelhofgasse. In the evening, the members of the Albanian deputation attended a performance of Fidelio at the Opera House. This was followed by supper at the Erzherzog Karl Hotel. This morning, the Albanian deputation was received at the War Ministry by War Minister Infantry General Stöger-Steiner von Steinstetten. First Lieutenant Colonel Myrdacz, representing Infantry General Trollmann, addressed the Minister on behalf of the deputation, to whom the Minister replied in his words of welcome. The War Minister then spoke to a circle of gentlemen, including several members of the deputation. The deputation then departed for a visit to the chief of the General Staff, General Arz von Straussenburg. As the chief of the General Staff was unavailable, the deputation was welcomed by his representative, Field Marshal von Höfer. Thereafter, the deputation was received in the reception rooms of the Navy Department. The deputy head of the Navy Department, Rear Admiral Rodler, welcomed the deputation in Albanian. 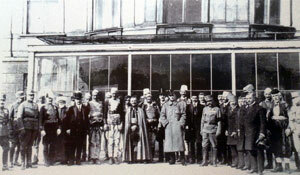 Hasan Bey Prishtina thanked him for his hospitality in a speech he gave in French. The deputation then drove by automobile up to Kobenzl, where they had lunch at the Schlosshotel. In the afternoon, the Albanian deputation visited Schönbrunn Park, the menagerie and the Gloriette. Some members of the Albanian deputation left Vienna today. Others, accompanied by the Highest in Command in Albania, Infantry General Trollmann, are leaving for Albania on Monday, 23 April. This morning, the Albanian deputation visited the boarding school for Albanian boys established in the Krottenthalergasse by the Imperial and Royal Ministry of Trade and Commerce. The deputation was welcomed at the school on behalf of the Ministry by Court Counsellor Dr Karl Simeons and by the school director, Dr Robert von Kéler, and then toured the school itself. Since part of the Albanian deputation had to leave Vienna last night, a festive dinner was held for all at the Hotel Meissl & Schadn. During the meal, the Highest in Command in Albania, Infantry General Trollmann, gave a speech in which he noted that all the members of the deputation were more than satisfied with their stay in Vienna. The members of the deputation had been particularly impressed by the cordial reception accorded to them by the Emperor and by Archduke Max. General Trollmann thanked all of the members of the deputation for the spirit of unity and harmony of which they had given proof on this occasion and expressed his hope that this unity and harmony would prevail in all circles, classes and tribes in Albania. The unity of all Albanians, he noted, was of great importance to the future of the Albanian nation. General Trollmann explained that he was happy to have noticed on this occasion that his activities in Albania enjoyed the support of all circles. The acceptance of and obedience to the orders of the Corps Command made his task easier, a task which he described as leading the country to unity, repute, satisfaction and happiness. General Trollmann concluded his speech with an appeal to all the inhabitants of Albania, with no exception, to support him in his work, with an expression of his gratitude to the Albanians for their devotion to him and with assurances that he had come to love them dearly. General Trollmann raised his glass to the prosperous future of Albania and to the Albanian people with the toast “Rroftë Shqypënija!” (Long live Albania!). 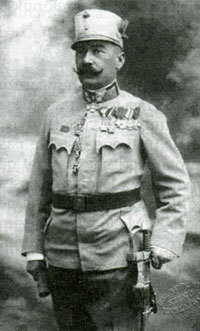 On behalf of the deputation, Hasan Bey Prishtina gave General Trollmann a snuffbox made of gold as a token of the devotion of the Albanians and said in a speech that General Trollmann was not only a faithful and beloved friend of the Albanian people, he was also a courageous soldier who, with this glorious army, had saved Albania from the ferocity of its enemies. General Trollmann could be assured that the Albanians would always be grateful to him and that his name would enter the annals of Albanian history with honour. 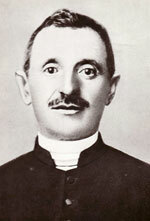 Monsignore Kaciorri stated that the Albanians were more than delighted at the extraordinary hospitality they had been shown in the beautiful city of Vienna. On behalf of all the delegates, he expressed his gratitude for the dignified reception accorded to them by the Emperor, Archduke Max, the representatives of the city of Vienna and of all circles of the population. On behalf of all Albanians, the delegates promised to support His Excellency, the Highest in Command, in his difficult task of promoting the Albania’s advancement with all their energy. Finally, Monsignore Kaciorri thanked General Trollmann to his beneficence to the Albanian people. The speech was received by the deputation with loud cheers for General Trollmann. General Trollmann and the delegates still in Vienna will leave for Albania on Monday, 23 April.